Who would not want silk textiles dressing their tables at their next event? Our Shantung Table Runners are a way we can all afford the lusciousness of silk without the expense. Climbing the Southern and Asian scenery of the past and present, Wisteria Shantung is a medium Violet hue with a touch of gray to soften this lavender to epic standards. 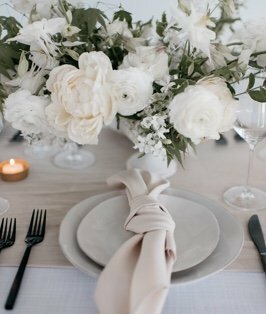 Your tables will never look better than dressed with our chic Shantung Table Runners. Try running them not only the length of the table, but across the table as well. There is more than one way to dress with our runners…so surprise your guests at your next celebration!